Named after the mother of Zeus, Hades, Poseidon, Hestia, Demeter, and Hera from Greek mythology, Rhea is a Minoan priestess living on Crete during the Bronze Age. She keeps a pet snake called Gaia and works out of one of the many cave sanctuaries on Crete. 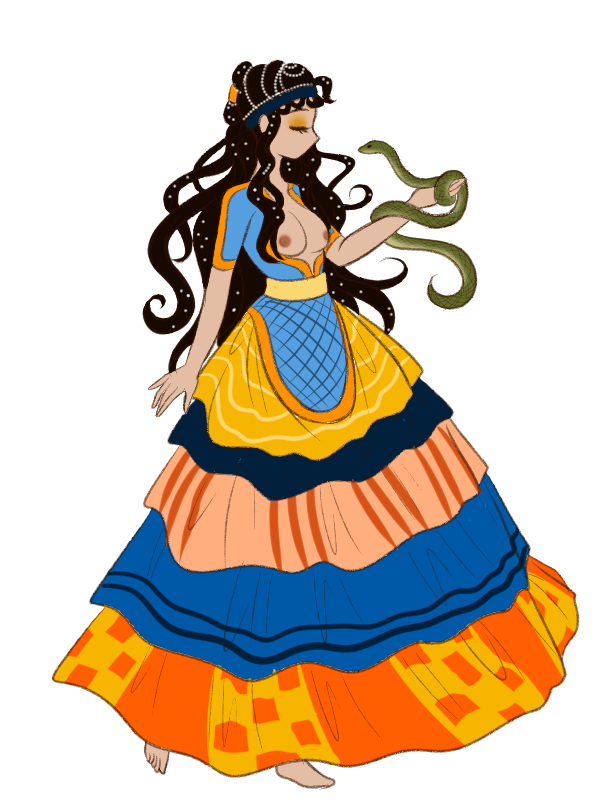 She comes from a long line of priestesses that have worked with snakes. Her younger sister is training to be a dancer, and her older brothers are fisherman. Her father died in a boating accident when she was young, and her mother died of illness when she was a teenager. She's 23 years old. I kinda improvised on the clothing, particularly the patterns, but also a bit of the design. Click here to see a version where her breasts aren't covered, as was kinda normal form what I've gathered from research about the Minoans (it's all casual research done for fun for a Minoan comic I've been planning so don't trust me entirely). Just a girl and her green noodle.